SIGN UP FOR THE LATEST NEWS AND PROMOTIONS! Strabismus is further classified by the frequency of the condition (constant or intermittent), whether one (unilateral) or both eyes (alternating) show signs of strabismus, and the degree of the turn (large or small angle). Six external (extraocular) muscles control each eye's movement and position. In order for binocular vision to work properly, the positioning, function, and neurological control of these muscles must work together perfectly to control the eyes. An anatomical problem, neurological condition, or trouble with the center of the brain which controls binocular vision can make it difficult to control the extraocular muscles, leading to strabismus. Individuals with uncorrected farsightedness can also develop strabismus. If the eyes are overly strained while attempting to focus on a distant object, they can become crossed. This condition is known as accommodative esotropia, and can usually be treated with corrective lenses. Genetics also play a prominent role in strabismus. Those with a parent who has strabismus have a much greater chance of developing the condition themselves. 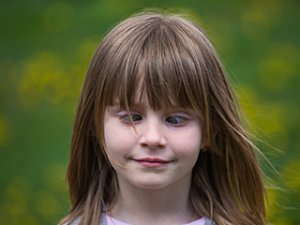 In addition, certain medical conditions such as Down syndrome, cerebral palsy, and stroke put individuals at a higher risk or developing strabismus. The most prominent sign of strabismus is the misalignment of eyes, which can lead to amblyopia and vision problems. Small angle strabismus often leads to eye strain and headaches. In addition, strabismus often causes young sufferers significant emotional stress, as it affects the ability to make normal eye contact with others. Eye care professionals diagnose strabismus using a series of tests: visual acuity, refraction, alignment and focusing, and an examination of eye health. Once strabismus is diagnosed, it can be treated according to its cause and severity. A case of accommodative esotropia can be corrected with glasses, but more serious cases of strabismus might require muscle surgery and vision therapy.